When the RMS Titanic floated out of its drydock in 1911, its architect and owners hailed it as “unsinkable” and the most advanced ship of its time. 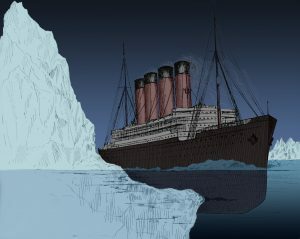 But on the fateful night of April 14th, 1912 those claims were put to the test, and the Titanic sank, doomed because of an iceberg no one saw coming until it was too late. A highly touted technological advancement in human ingenuity and engineering literally sank because of frozen water. Ironic. It’s also ironic that something as advanced as an enterprise network can be derailed by microscopic specks of debris, and yet, that’s exactly what happens when you allow contaminated fiber end faces into your data center. An efficient network is the back bone of any successful business, and there isn’t room for connectivity issues or downtime. Multiple studies have shown connector contamination is the single greatest cause of fiber-related failure—and the industry knows this. So why are contaminated end faces still such a problem? In most cases, following a stringent “Inspect before you connect” process every time you work with fiber can minimize contamination and prevent costly repairs. The most critical element to safeguarding quality fiber connections is ensuring a proper end-face condition; essentially, watching for your network’s icebergs before they become a problem. Network uptime and signal performance utterly depend on perfectly aligned and thoroughly clean end faces. When working with fibers only a few microns wide, any contaminant can be catastrophic. Contaminants exist all around your network, whether it’s dirt, dust or oil. These contaminants interfere with light transmission along your fiber, causing back reflection and insertion loss—all of which means your network isn’t working the way it should. The allowable margin of error is tiny, and proactively inspecting and cleaning end faces, organizations will enjoy reduced downtime, optimized signal performance and minimal network equipment damage. Optical networks have come a long way, and production design techniques have eradicated most of the difficulties in achieving core alignment and physical contact between connectors. But even with these advancements, the challenge to maintain a pristine end face remains. 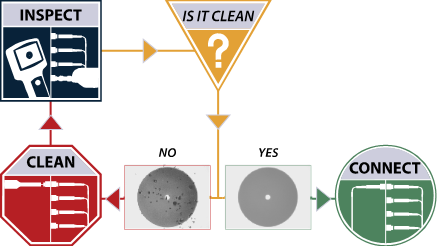 The VIAVI white paper, “Testing Parallel Optics” describes just how much damage can occur from dirt, as well as detailed instructions for inspection, cleaning, and (re)inspection. Visual inspection is the only way to know whether an end face is truly clean, but human eyes aren’t reliable enough. The goal is to eliminate any variability in the process, and that’s where standards like the IEC 61300-3-35 come in. This standard sets the inspection requirements for connector quality and in determining replacement or cleaning. A microscope specifically designed for fiber inspection is the only way to determine without a doubt whether connectors are clean before they are mated. It doesn’t matter whether the connector is brand new out of the box or has been in the field for years. Always—always—inspect before you connect. These preventative measures when installing and maintaining your network will save you both money and time. Considering the importance of network uptime, equipment reliability and signal transmission speeds, recognizing the importance of clean connectors is a must for optimal performance. Remember, something as simple as a block of frozen water took down the most modern and supposedly unsinkable Titanic. A speck of dust can do the same to your network, sinking your company’s productivity into an abyss. For more info on fiber inspection including articles, product info, the IBYC video series and more, visit us at viavisolutions.com/inspect.